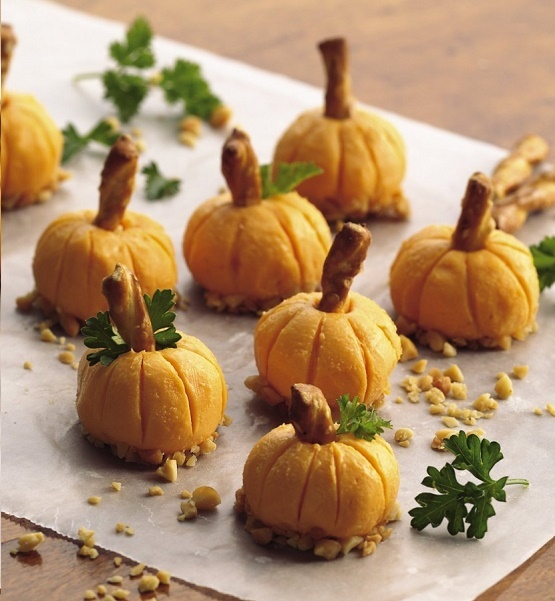 Halloween is coming, and one of the best ways to welcome this season is to prepare a creative, healthy and delicious Halloween recipe for your whole family. You can also share this simple recipe to all those children who are trick-or-treating. The things you need for this recipe. On a plate with waxed paper, roll a tablespoon of cold pack Cheddar cheese and form a round shape. Arrange it well. Refrigerate for about 10 to 15 minutes. Draw ridges around the balls using toothpick to make it look like a pumpkin. Dip the bottom of the round cheese in chopped peanuts. For the pumpkin stems, insert pretzel stick at the top. Garnish with fresh parsley as leaves of the pumpkin. Do not forget to share this simple Halloween recipe to your friends and family.